Thanksgiving 2012 will be an unforgettable event in Riviera Nayarit. Beauty, Nature, Luxury and harmony have come together in a perfect balance in this destination. Invite the spirit of Thanks into your body, mind and soul. They will be grateful to you. Villa Bella Bed & Breakfast Inn offers a Romantic Getaway including romantic dinner for 2 at Frascati Ristorante, Airport pick up 'till 6:00 PM, full made to order breakfast served at the pool terrace, welcome cocktail at check in and all taxes from 179 USD per suite per night. Marival Residences & World SPA savings are up to 30% off their luxury All Inclusive with unlimited Select Tours & Golf from 191 USD per person per night. St Regis Punta Mita Resort invites you to escape to paradise and don't miss out on this exceptional opportunity to enjoy a memorable Under-the-Stars Thanksgiving. Rates start at 399 USD per night. 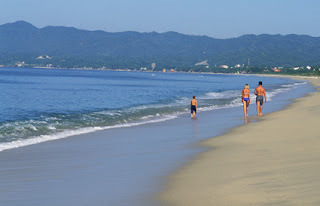 Bell Air Vallarta All Gourmet Plan including meals and drinks a la carte and a swimming with dolphins experience is available from 90 USD per person per night.